As a local roofing company in Indianapolis, our single goal is to enhance the value, comfort and security of your home. 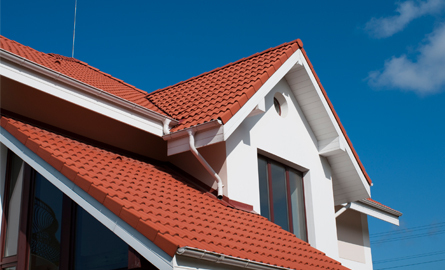 We have been providing roof repair and replacement services to homeowners for over 20 years. We also assist in the insurance claims process if your roof has suffered from storm damage. For all your roofing needs, call us anytime. We're available 24/7 and offer free estimates! We are available for 24/7 for any roof repair emergency you may have. We handle roof leak repairs quickly and thoroughly. We handle storm damage repairs and we work with all of the major insurance companies to make sure your home is returned to original condition. 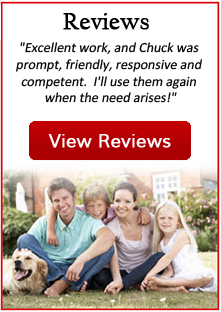 Our expert roofers apply the same dedication to emergency roof repair that we do to scheduled work. If you’ve suffered storm damage or other roof leaks, we’ll make immediate repairs to protect your house and belongings and we’ll give you a free estimate if further repairs are needed. We are a residential roofing company specializing in asphalt roofing. Call for emergency repair service or a free estimate on any roofing issue you may be having. 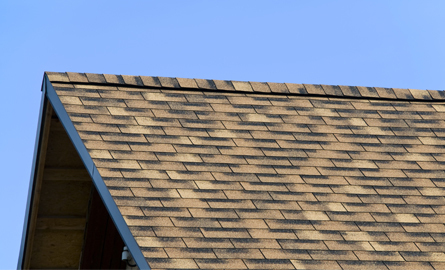 Working with top name brand underlayment and shingles, we’ll install a beautiful, weather-tight roof for your home. We give the utmost attention to vulnerable flashing areas like roof valleys and around protruding vents and chimneys. As our roofers work, they will stay mindful of your schedule, clean up after themselves and stay organized at all times. We are BBB-accredited, have great reviews on Angie’s List, and RCI (Roof Consultants Institute). With over two decades in business, we are also fully licensed and insured. Call us today! Low slope roofs present unique difficulties. The surface might be subject to increased traffic from workmen and building staff. Fixtures like air conditioning units and exhaust fans can cause leaks if improperly installed. If water pools on a low slope roof, damage is inevitable. We make flat roof repairs on commercial buildings. We have experience with all of the commercial roofing materials, including single-ply membranes like TPO and EPDM. 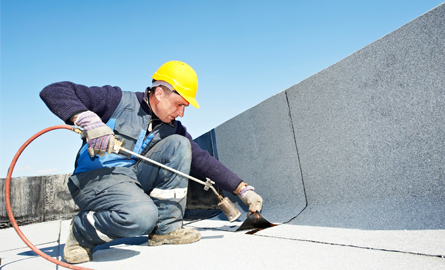 Our commercial roofers repair, replace and install commercial roofing. Quality siding can give your home a dramatic makeover that not only looks great, but protects your home from the elements, as well. 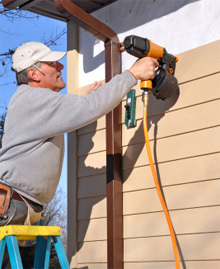 Siding is one of the most cost-effective remodeling investments you can make. 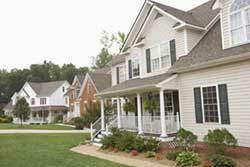 Vinyl is the most popular siding application in America. It’s durable, economical and it offers the widest range of color options. The color is integral in vinyl siding, running all of the way through the material. You’ll never have to paint or caulk vinyl siding. The only suggested maintenance is an occasional wash with a mild soap and a garden hose. Fiber cement siding is another popular choice with homeowners. Just like it sounds, blending cement, sand and cellulose fibers gives this product a sturdy base for any number of styles. Smooth or wood grain textures in a variety of finishes can give you the rich appearance of real wood without the problems and maintenance requirements. You can choose from pre-primed or factory painted material. We offer HardiePlank siding, the #1 fiber cement siding. From designer and manufacturer James Hardie, HardiePlank has established a reputation for quality. It is engineered with climate-specific features for our area. HardiePlank comes with a 30 year non-prorated, transferrable warranty and has earned the Good Housekeeping Seal. We can examine your gutters and give you a free estimate for all-new gutters that will safeguard your home from drainage problems. Window ReplacementEnergy-efficient replacement windows can effectively lower your utility bills, make your house quieter, and more comfortable. If you’re living with drafty older windows, chances are that window replacement will save you money and make your house more attractive. You can choose from an array of energy saving features like double or triple hung sashes and low-E coating. We install windows in custom sizes as well as factory models. Our WorkAll of our work is performed to the highest standards of quality workmanship. We maintain an A+ rating with the Better Business Bureau and you’ll find us on Angie’s List. 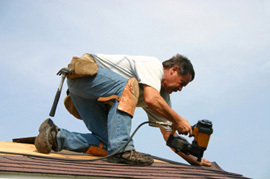 Call on us for dependable home improvement and emergency roof repair. We offer free estimates and onsite consultations. Call our roofing company in Indianapolis, Carmel, Noblesville, Zionsville, Lebanon and nearby areas.